Anyways, yesterday I was craving that old comfortable and warming dish. 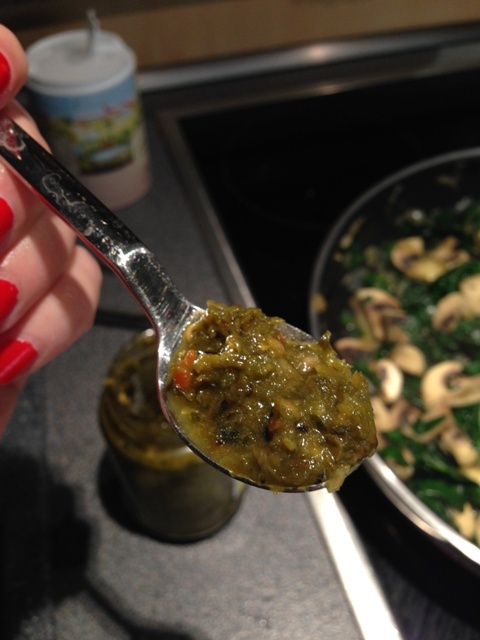 Since I didn’t have nettles I substituted them for fresh organic spinach, and I used quinoa instead of rice! I literally made the pictures while I was cooking, so apologies if they are a bit dark and blurry. I got so excited as my old memories came to the surface, triggered by the comforting senses of the spices, that I decided to record the process and share it with you. It is really easy to make, and it will take you only 30 minutes to prepare, I promise! Quinoa is a gluten-free grain that contains more protein than any other grain. The grain is so rich in amino acids, that it is considered a complete source of protein, high in lysine, methionine and cysteine – ideal for post-workout meals to help build muscle. It is also high in folate, magnesium, phosphorus and manganese, making it a nutrient-packed source of carbohydrates for long-lasting energy levels. Spinach is among the healthiest vegetables you can eat. It is rich in vitamins and minerals (vitamins K,A, C, manganese, folate, magnesium, calcium), it is also concentrated in health-promoting phytonutrients such as carotenoids (beta-carotene, lutein, and zeaxanthin) and flavonoids to provide you with powerful antioxidant protection. 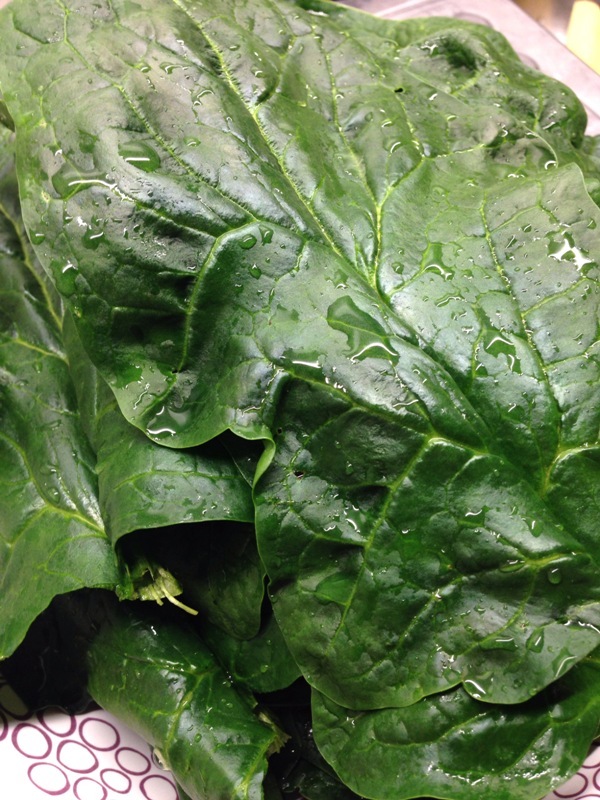 Spinach is an excellent source of iron, a key component of energy production in the body. Crimini mushrooms may sometimes be a valuable source of vitamin B12. Even though this B12 issue can be a little confusing, we believe it’s important for you to know that recent studies have found significant amounts of vitamin B12 in some samples of fresh crimini mushrooms. The B12 in these mushrooms was apparently produced by healthy bacteria growing on the surface of the fresh mushrooms. Mushroom content of B12 varied significantly, and sometimes it varied from farm to farm. Traditionally, we’ve thought about animal foods as being our only reliable source of vitamin B12. Animals tend to store up small amounts of this vitamin after it has been produced via being consumed in a food or produced by bacteria in their digestive tract. This way of thinking about vitamin B12 still holds true. However, it might also be smart for us to start thinking about fresh mushrooms (including fresh crimini mushrooms) as a potentially valuable source of vitamin B12. I also used nutritional yeast in my recipe, as nutritional yeast is a great source of vitamin B12 and I find it compliments well to this dish with its light cheesy flavor. So without any further ado here is what you will need to prepare this dish. Start by preparing your quinoa first. You can soak the quinoa for 45 minutes up front if you have the time, but it is not absolutely necessary. Rinse it well under running water. Boil 300ml of water with the vegetable stock and place the quinoa inside. Cook for about 12 minutes until the quinoa is fluffy and soft. In a separate pan insert the coconut oil, the chopped onion and garlic. Sauté them for about 3-4 minutes until the onion softens and becomes light-gold. Add the chopped mushrooms in the pan and sauté for another 5 minutes, stirring frequently. Wash the spinach well, chop it and add it to the mushrooms and onion, once you see the mushrooms are softening and turning light brown. The spinach will release some of its water so the mushrooms will soften further. Look at this green beauty! Add some salt, pepper, and a bit of thyme. Here I have added a special ingredient which unfortunately you can’t find in the store. My parents make this amazing spicy goodness from green chili peppers, garlic, honey and parsley and it makes every dish taste absolutely divine! 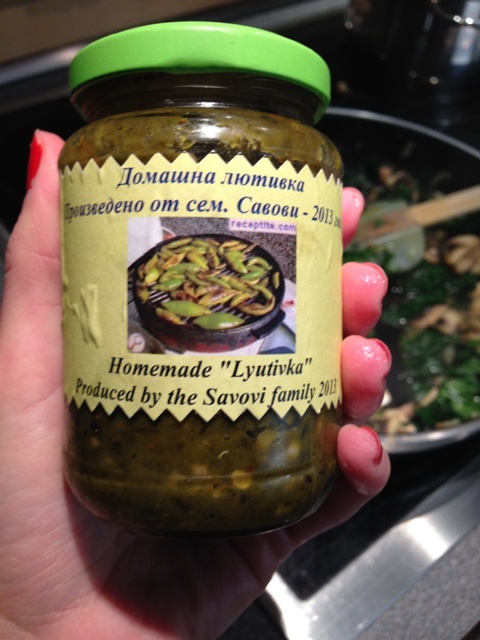 It is a secret ingredient I use in a lot of my dishes, as I love spicy food! 🙂 No worries, you can add some cayenne or chili pepper if you are a spicy lover too. This is the magic my parents are making every year! They are still hiding the recipe though! Next, add the tomatoes to the pan and mix well. When the water has almost evaporated add the cooked quinoa to the veggies, the nutritional yeast and lemon juice. Mix well and adjust the salt and pepper to your taste. 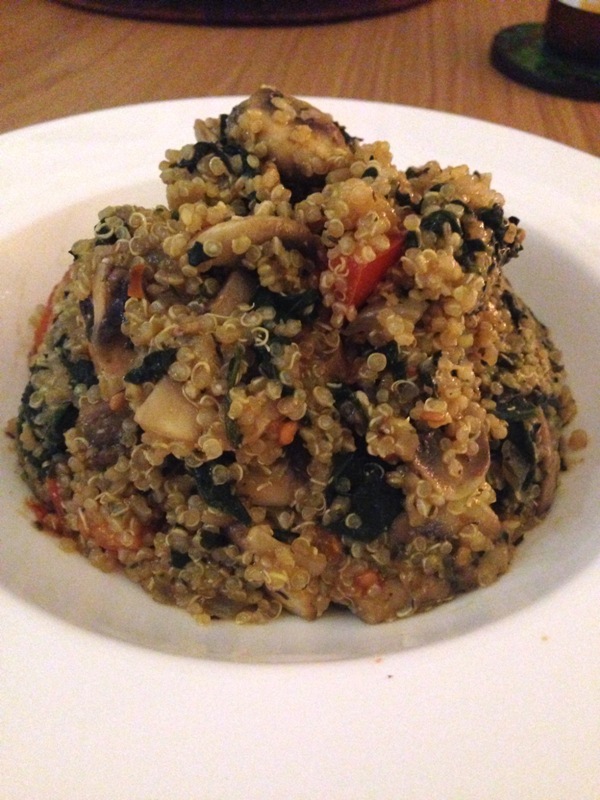 That looks like a perfect dish – cannot beat quinoa!